ECR vs PostDoc, what’s the difference? Most of the topics I write for the Online Academic blog are directed at any academic; a person who’s in the academic sector or who’ve gained a higher university degree and still do work related to their qualification. I Tweet a lot of my blogs using hashtags, I’m a little lazy when it comes to searching for new ones, but I generally stick to Phd or ECR related hashtags because they encompasses all academic fields. But I’ve often wondered what is the difference between an ECR and PhD? At a conference I went to last year (2015) I was very proud to wear a fantastic T-Shirt made by Digital Science with ‘Post Doc’ printed on the front in the style of the rappers from Run DMC‘s logo, I thought it very cool, however, a colleague explained to me he didn’t like the term ‘Post Doc’ since he thought it undermined the achievements of the person. I don’t remember word-for-word what he said but it struck me I hadn’t thought about it before, PostDoc was just a state I wanted to achieve and I had so I was happy when I did. How long have we been using these terms? The term Postdoc looks like it has been around since around the mid 1950s with a quick look on Google book NGram viewer, but sadly I can’t really find the term ECR by this method because it’s an initialism for which a lot of other things stand. There isn’t an entry on Wikipedia for ECR yet either so I can only posit that it’s a fairly recent term. I did a search on Google looking for Early Career Researcher between specific dates, hoping to find some file referring to it but it got too complicated, so I did a ’20th century’ search in Google Books and found it used in a 1996 book (see below). It appears that the term Early Career Researcher has been used at least twenty years. ‘Postdoc’ is short for Post Doctoral and this stem is added to ‘researcher’ to mean, generally (according to Wiki) someone who goes around from institution to institution gaining more experience and skills as a researcher before settling somewhere. Not that different from my definition really. Early Career Researcher, a definition by Adrian R. Eley, Biggs and Pitts (2012) is a little convoluted and extensive to sum up in one sentence here but basically says that the ECR encompasses the three stages of a PHD; doctoral student, postdoc worker, and academic staff. Quite different from what I thought. Other definitions (a quick Google with show you) say it’s someone who’s completed their phd between 6-10 years ago. Not sure what you are called if it’s longer than that. So there isn’t really that much difference is there and I’m still none the wiser. Why? It mattered to my colleague at the conference and I think it mattered to him because the way post-docs are treated. The term ECR is a slight improvement, but I’m not sure the definitions I’ve found do it any more justice than the term ‘postdoc’. It didn’t matter to me what I was called, save for being legitimately called Dr., but we should take notice of what these evolving terms and words mean because we are and become them in a global system that produces them. We’re a global community of innovators and thinkers so we should at least be able to come up with a Wikipedia page for ‘ECR’. Please add your comments and enjoy the rest of the Online Academic blog. Me at the joint ECoP – ISoP (European Congress and International Society of Protistology) Seville conference in Spain, 2015. Everyone needs a side-kick, a buddy to help them get on in academic life because It’s nice to know someone has your back every now and again and Evernote was my side-kick when I was doing my PhD as well as during my post-doc, not to mention in my personal life too, oh, and so that means… OK, you get what I mean. Evernote is a, fundamentally, a note-keeping app. I say ‘keeping’, because you don’t have to make notes with it, you can collect ones you already have. Evernote available online through your search engine, downloaded to your desktop and mobile devices. text by typing – as per any note-taking app, how conventional! scribbling – if you have a deft hand, digital pen or wiggly finger, go for it! scrawl pictures and doodles – like the previous point, go for your life, as long as you understand it, right? audio – record what you like (if in company, maybe ask permission first). photos – take a photo (of posters, slides) rather than type. clip internet pages – Evernote made a fabulous ‘widget’, a button to add to your internet browser that will give you options to clip webpages as a whole; text; as pdf (if there is one) – in one click. save pdfs – keep the pdfs you may not want with other pdfs in Evernote instead, e.g., policy documents, online contracts, conference itinerary per se. Is your mind reeling yet because I’ve only recalled these examples off the top of my head? Occasionally, maybe more than that, I have one page of notes in my pseudo-Moleskine that I need to to access from anywhere at any time, so I take a snapshot of that precious page with my phone/tablet using the Evernote app. thus making a digital note of it. I make a note of my note… getting meta now. The Evernote app sync across all systems and devices, automatically. Syncing across all devices is precisely why Evernote is so brilliant to use. Versatility with notes and other apps (so many other apps) is what makes it a great adaptable note-keeper. What makes it a clever note-keeper is the search, it can search not only your typed notes but your written AND photographed notes too. Oh yeah. I can’t contain my love for Evernote as I write this, it’s so good searching through notes (and by the way, I do not work for Evernote, I’m just a fan). Numerous blogs about using Evernote for productivity and organisation are out there but I’ve never read them (until I was researching for this blog) because I’m still so happy just using the tools I’ve found on my own – it’s that intuitive to use. I’m not the only one who is evangelical about Evernote. A quick internet search will show you how lots of academics (and non academics) use this app because there isn’t one correct way to use it – another great thing about Evernote. I encourage anyone who is breathing out carbon dioxide and has a job with meetings and notes and emails to try Evernote. This piece is part of the tools section of the Online Academic blog. See other tools I recommend. ReadCube is many things; it’s like an iTunes for your PDFs but SOOOOOO much better cuz it works really well (sorry Apple, not. ), its a pdf reader, it make searchable notes, annotates pdfs, finds new articles, yes, ReadCube actually does that for you! Oh, just read the blog. I am writing this piece for a great friend, ‘Becca, who’s just started her PhD and she knows I advocate using lots of online tools for academics but I never got around to showing her ReadCube cuz there just wasn’t enough time! So here you are, Becca, this is for you. Yes, more list-making (I love lists, it’s the taxonomist in me). Even if you don’t have all the papers in your library, don’t worry, use ReadCube to search for articles via PubMed/ GoogleScholar and download new articles (via your institute proxy servers!) is a great way to keep focussed while on your paper-trail since you don’t have to dip in and out of the program. Highlight your favourite passages in your PDF and make notes as you read, you won’t need to remember what your fervent scribbles mean any more. View Supplemental Material! Yes, it’s much easier to view additional material (not for every article as it depends on the source and download – e.g. if it’s yours and you didn’t include it then it won’t), so it’s not perfect but lots better since I last used ReadCube. 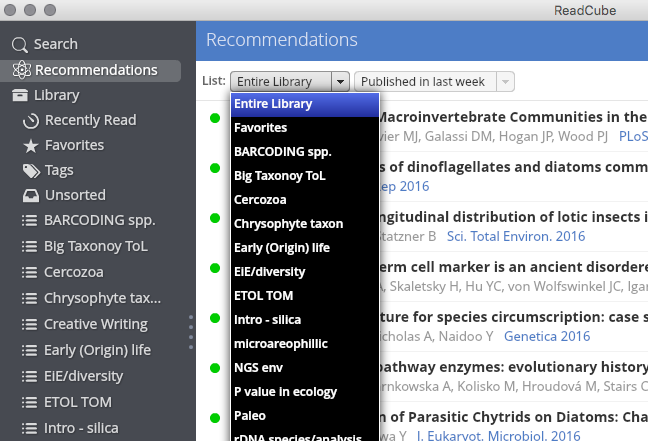 Citation tool – export your reading list to your reference manager! Yes, it’s so easy to export your whole reading list (highlight all articles and right click) to your citation manager, you might even want to send it to a colleague so they can see what you’re reading – keep it for your course students! Metrics. This will tell you how often the article has been cited and tweeted, but only if you get the ‘Pro’ package. Bookmarklet for your web browser too. I could go on about all the features but I think you ought to just try it out for yourself, it won’t take long. ReadCube helped me organise myself a lot during my PhD and PostDoc, and now they have apps available for your Android, and Apple portable devices, even the KindleFire, so you can read on the go. Good luck to my friend, ‘Becca, I hope this keeps you feeling on top of things, and good luck to anyone else embarking on their PhDs this academic year! On Twitter or need help reaching out to other academics through your account? It’s now 2016 and I’ve had a look at the stats of the Online Academic blog to see which posts have come out on top in 2015. I posted 30 times, which generated 26,820 views from 13,0002 visitors, so that’s at least two views per visitor. The most avid readers were from USA followed by the UK and Australia, Canada, and Germany. Many many thanks to all of you who came to visit. I’ve mentioned before ‘how’ academics use Twitter, but this doesn’t cover ‘why’ they use Twitter. “If you are gonna waste time, it’s going to be on something useful, like Twitter!” (@MicahDunthorn September 2015). I’ve spoken to a number of academics who love using Twitter as an academic, and below are a few answers to why they use it. Sometime’s references are hard to find on the internet but it’s so easy to Tweet the article reference and go back later to see if anyone has found it. It doesn’t matter how many people you have in your following, with the right hashtag it’ll be visible to a wider audience. Many academics can be socially nervous. Twitter has made it easier to connect with those who you might not have had the courage to approach before. All they need to do it like or following the tweets of the person they want to connect with, or send them a tweet or DM. Being more visible online can leads to public speaking jobs and invitations to conferences that you may not have been considered for before. Researchers might be looking for someone like you but not realise what you are up to right now cuz you never answer your email, so Twitter is a great way for people to know what you are up to and find out, in a casual way, if you are interested in collaborating. Meeting people is easier, less awkward that waiting in the background while they finish their conversation. Tweeting keeps you interested in talks because you are actively listening for sound-bytes to Tweet about. I have used tweets as a note-taking tool. Hear about venue changes and parallel sessions. If you’re lucky enough, the conference organisers will tweet from a dedicated account. Keeping in touch after the conference. All those people you met you can put in your own twitter conference list. It’s great when we publish, get funding or a promotion. Tweeting every achievement and pinning it to your newsfeed is a way of advertising your work and have it reached by more people, making it more worthwhile. I tweeted that I completed and passed my Doctorate, and this was great for me because someone on Twitter saw the Tweet and offered me a post-doc. There are a lot of reasons to celebrate, and using Twitter can help move that celebration into another. Many researchers are expected to appear to be reaching out to the public (or whoever) with their research. Twitter can be a vehicle for that use, be it to spread news of open days, workshops, blogs and websites. Hot debates on things in your own field; learning what they are can really help build confidence. Discussing aspects of your work in concise ways can help to see how things may sound to yourself and others and help improve your communication. It’s great to have a network of people in your own field with whom you can share first-hand information about the latest jobs and funding applications. What kind of maintenance tasks are there to do for my Twitter account? Scheduling: Find content from the web (or other tweets) to tweet using a scheduling application. (Don’t want to tweet them all at once and annoy followers so stagger the posts). Why would you want to maintain your Twitter account? The answer depends if a) You want an influential account and need more followers or b), You use your account as a tool for networking and connecting with the right people. In both instances it’s worth understanding that active accounts, those accounts which tweet and interact regularly, are far more responsive to growth and interaction than those which do nothing. But even if you aren’t interested in an account with lots of followers, using your account as a tool to interact and connect with the right people for your career, by maintaining contact lists and responding to queries, these are important daily exercises for a vibrant account that will serve you well over the years. If you’re a more involved Twitter user and don’t need encouragement to be active all the time, you still might need steering towards doing a little housekeeping; organise lists, find accounts to follow, read or search for your favourite tweeters. In this way you’ll augment your experience of Twitter and become, if you’re not already, a more confident and knowledgeable user. Follow new accounts – look for accounts similar to yours and follow those who follow them. Unfollow all those accounts that either don’t follow you back, are spam or are unused ‘dead’ accounts. The second list of maintenance tasks shown above are best performed with the help of other applications, such as Tweetdeck, Hootsuite, Buffer, Klout and many more big and trusted programs to help you understand more about your Twitter accounts influence and even geographical influence. Some of these apps come with a certain amount of use for free; unfollow up to 50 users per day, follow up to 50 users per day, etc… (More on apps in the next section in this chapter). I enjoy taking the time to use these apps to sort out my Twitter accounts since I get to know the types of accounts that follow me, where they comes from and what tweets are most popular. It’s a bigger task, but then I like to take my time with a coffee and relax to some music whilst doing it.